For server and storage systems needing maximum throughput, the SAS 9302-16e HBA delivers up to 2.8 million input-output operations per second. 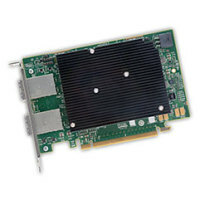 Using two SAS 3008 12Gb/s SAS controllers with a 16 lane PCI Express 3.0 interface gives Broadcom the highest performing HBA. Achieves up to 2.8 million IOPS for performance-sensitive applications.